Bold, chrome-plated grille highlights the nose, which is tall but does not obstruct forward vision. This truck series also fills a gap for General Motors, which left the medium-duty market in the face of the Great Recession in 2009. GM tried selling its midrange products, which at the time included Class 4 through 7 trucks and Baby 8s. Navistar considered buying the line, but instead brought out its TerraStar, using purpose-built chassis and cabs from larger Internationals. Partly because of problems with its MaxxForce V-8 diesel, that model lasted only a few years. Meanwhile, GM had simply walked away from the mid-range business. As the economy revived, Navistar and GM decided to re-enter this segment, and agreed several years ago to jointly develop a new series. The result is the CV and similar versions for the Chevrolet Division, which calls them 4500HD and 5500HD; there’s also a Class 6 variant, the 6500HD. Navistar won’t have that because it covers Class 6 with its MV (for medium vocational, formerly the DuraStar). And with the CV’s maximum gross vehicle weight of 23,500 pounds, “there’s some creep into Class 6” anyway, according to Chad Semler, Navistar’s director of medium-duty product marketing. Thus GM and Navistar are partners in this new line, while Chevrolet and International are competitors. In fact, “I think Chevy will be my biggest competitor,” said Eddie Kelley, a sales representative at Rush International Trucks on the southeast side of Indianapolis, where he and I roamed around with the green dump truck featured here. Two easy steps and you’re in (or out of) the roomy pickup-derived cab. Nicely trimmed interior includes easy-to-use controls and legible gauges. Per the agreement, GM supplies the engine and, through Allison, the automatic transmission. It also furnishes completely trimmed cabs, which are based on lighter-duty Silverado pickups and cab-chassis models. Navistar supplies the chassis, and builds both product lines at its plant in Springfield, Ohio. Full production began in early December and dealers began receiving the trucks soon after, both companies said. Equipment varies only for applications, so if an International CV and a Chevy 4500HD or 5500HD are spec’d for the same job, “the only difference is the grille and the logo in the horn button on the steering wheel,” Semler said. 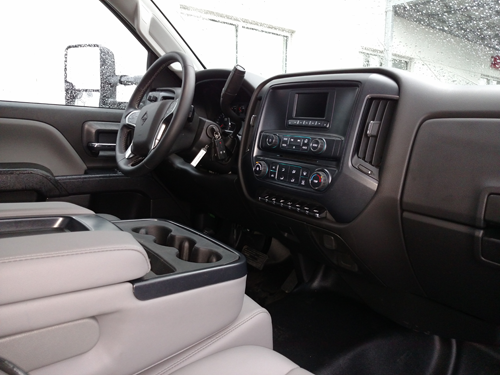 Electronic controls and operating software are GM’s and are shared with Navistar, so a truck could conceivably be serviced at either a Chevy or International dealer. The CV’s large chrome-plated grille with its orange diamond logo resembles those in larger and heavier Internationals, and the logo reappears on the steering wheel, as Semler mentioned. Otherwise, if you’re used to driving pickup trucks, specifically Chevrolet’s Silverado, you’ll feel right at home in a CV. That’s a good thing, because interior trim is tasteful and instruments and controls are easy to see and use. As befits a modern truck, electronics abound and multiple infotainment options are available, including an 8-inch color touch screen with navigation and, for the first time in an International truck, Apple CarPlay and Android Auto. I left most of that stuff alone and concentrated on the driving experience. Yes, there was the pickup resemblance, but with its stout frame and suspensions, this CV felt like the heavier truck that it is. The steel dump bed was empty, so the ride was stiff and choppy at times, but that also meant that acceleration was brisk. The diesel makes as much as 350 horsepower and 700 lb.-ft. of torque, normal for trucks in this weight class where drivers expect car- or pickup-like performance. The Allison autotranny works smoothly and efficiently and is renowned for its durability. Up- and downshifts were almost imperceptible. I did notice a slight shuddering as the truck started out from a dead stop; Kelley guessed that it was the torque converter locking up. He seems qualified to judge such things because in his past life he was involved in the mechanical end of motorsports, building racing engines and chassis, along with two years as a NASCAR driver. Of course, this CV was no race car—it was electronically limited to 65 mph—but its handling and steering were taut and precise, and brakes were strong. The truck was nimble, quick, and fun to drive. 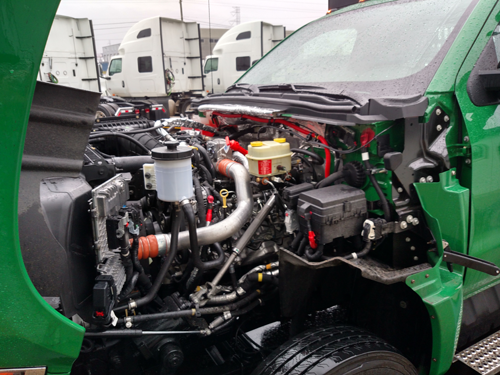 GM-supplied Duramax V-8 diesel is called “International 6.6” by Navistar. 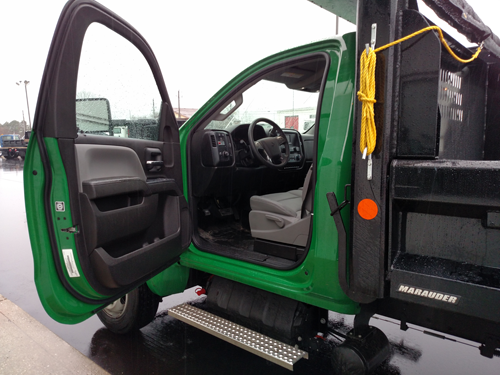 Although the Allison transmission can be fitted with a mechanical power takeoff, the dump bed’s hoist was an electric-over-hydraulic mechanism mounted on the frame just behind the cab. Up and down buttons were on a tethered remote box inside the cab; the empty box went up and down fast. When it’s raised, a red light on the dash shines brightly to warn a driver, lest he forgets to lower the box and motors merrily down the road and bashes an overhead bridge. That happens more than one would think, Kelley said, necessitating calls to a Rush International tow truck for extrication service. Speaking of service, it should be easy to work on the engine and its accessories because the CV’s hood-fender assembly fully tilts out of the way, unlike the stationary noses and alligator hoods used by Ford and Ram, noted Semler and his colleagues at the CV’s launch last fall. With the hood up, a driver or technician can stand right next to the engine and do his checks or service work. “If it’s a fleet that does a lot of maintenance, they will see it as a big advantage,” Semler said. “A retail buyer who takes his truck in for service might not see it that way,” though a driver will appreciate the ease of reaching for a dipstick and eyeballing belts and hoses. 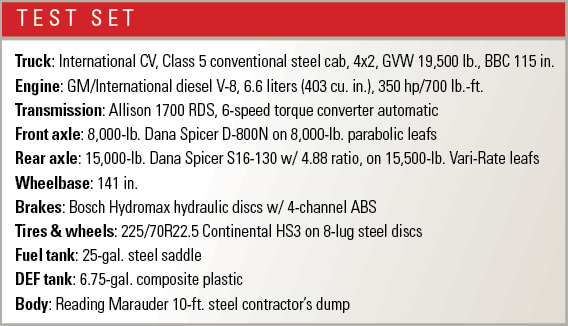 International offers only the two-door regular cab, as on our test truck, and a four-door crewcab. An extended-cab version would accommodate more storage without being overly long, and that might come later, Semler said. So might a gasoline engine option, which would reduce upfront cost. As it is, enthusiastic dealers have ordered large numbers of CVs to put in stock and will have many upfitted with work bodies. Look for them on their lots and check them out. You’ll probably be impressed.